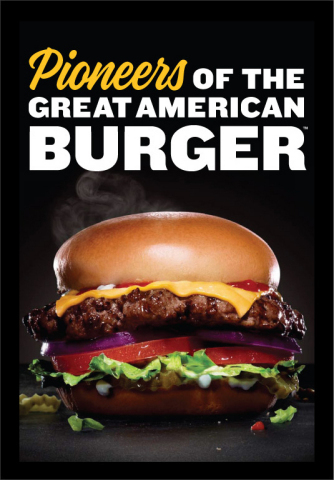 FRANKLIN, Tenn.--(BUSINESS WIRE)--CKE Restaurants Holdings, Inc. (“CKE”), parent company of Carl’s Jr.® and Hardee’s® restaurant chains, today announced the official launch of its new advertising direction and brand ethos, beginning with declaring their rightful status as “Pioneers of the Great American Burger”; the title will also serve as the company’s new ad tagline. As a first step in this new direction, CKE debuted their “Pioneer Anthem” commercial last week – It’s 30 seconds of tantalizing adrenaline that delivers the most in-your-face, deliciously pop culture-driven fast food history lesson of your life, all set to a beat-thumping electropop soundtrack that hits harder than a Jalapeño Popper®. 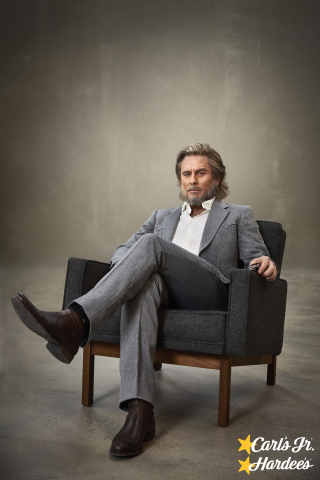 This week, the company introduces its new silver-fox of a spokes-character and fictional founder, Carl Hardee Sr. (portrayed by actor, singer, comedian, Charles Esten), who epically personifies this new irreverent, quality- and pioneer-focused direction. In CKE’s newest commercial spot titled, “Carl Hardee Sr. Returns,” Carl Hardee Sr. is seen “taking back” the company from “son,” Carl Hardee Jr. (portrayed by the Upright Citizens Brigade’s Drew Tarver). 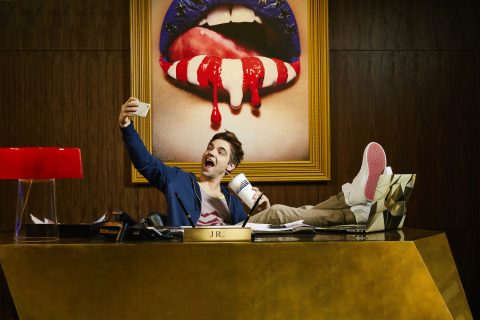 The self-parodying commercial campaign was developed by Los Angeles-, New York- and Amsterdam-based creative agency 72andSunny, and will have its nationwide broadcast debut on 4/1, during Adult Swim™ on Cartoon Network™, which draws an audience of millions each week. Modernized company logos - The previously retro-inspired logos will be replaced with a bold, yet streamlined, modern typeface that combines the classy, smooth look of the original script font with an elevated sensibility; a simple yellow star will remain a focus to honor CKE’s iconic “Happy Star” heritage. Food photography (including product imagery, menu boards, billboards and point-of-purchase promotional assets) - Characterized by a dark and bold richness, each menu item will see its inherent quality and dripping deliciousness put in the spotlight — literally. CKE’s menu offerings are taking center stage as the hero for this rebrand, and the company’s updated presentation style ensures nothing distracts viewers from the true star of the show: the food. Carl’s Jr. and Hardee’s will continue to serve the signature, premium-quality products that customers have come to revere, including their line of 100 percent Black Angus Beef Thickburgers®, Hand-Breaded Chicken Tenders™, Hand-Scooped Ice Cream Shakes™, and all-natural beef and chicken products, all brought directly to you with sit-down restaurant-style table service. CKE Restaurants Holdings, Inc. (“CKE”) is a privately held company headquartered in Franklin, TN. CKE is not a franchisor and conducts substantially all of its restaurant activities and operations through its subsidiaries. Carl’s Jr. Restaurants LLC and Hardee’s Restaurants LLC own, operate and franchise the Carl’s Jr., Hardee’s, Green Burrito® and Red Burrito® concepts. Carl’s Jr. and Hardee’s operate as one brand under two names, acknowledging the rich regional heritage of both banners. After opening their first New York and New Jersey restaurants in 2015 and recent international openings in Chile, Cambodia and Kenya, Carl’s Jr. Restaurants LLC and Hardee’s Restaurants LLC now have over 3,800 franchised or company-operated restaurants in 44 states and 41 foreign countries and U.S. territories. Known for its one-of-a-kind premium menu items such as 100 percent Black Angus Thickburgers®, Made from Scratch™ Biscuits and Hand-Breaded Chicken Tenders™, as well as an award-winning marketing approach, the Carl’s Jr./Hardee’s brand continues to deliver substantial and consistent growth in the U.S. and overseas. The Carl’s Jr./Hardee’s system is now 94 percent franchised, with international restaurants representing 21 percent of the system. For more information about CKE, please visit www.ckr.com or its brand sites at www.carlsjr.com and www.hardees.com.